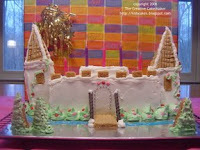 After making this cake, I decided if I ever made another castle cake, I would probably use a denser cake. I love Pillsbury cake, but it's so moist that it doesn't perform well for taller cakes. stack three tower pieces together (with icing between layers) and place it on one side of the cake. repeat with the remaining three tower pieces and place on the other side of the cake. Ice completely with white icing. The remaining 1"x4" cake piece goes on top of the main section (in the middle). Ice it over. The turrets, trees, drawbridge, windows, etc were all made with peanut butter cookies. I cut castle pieces out of the dough and baked as directed. The I assembled using the icing as "glue". I would recommend finding something easier to use for the turrets. Maybe a couple of ice cream sugar cones or something. The doorway is outlined with silver decorating balls and above the doorway are more hearts. The drawbridge "rope" is simply 2 chocolate covered candy sticks anchored to the "floor" with icing. I piped some "vines" onto the towers and added more candy hearts as "flowers". Blue decorating gel finishes it off as the water in the moat.